Well, the tomorrow of October of 1923. Another article from my favorite techno rag, Popular Science Monthly. Once again, a little overboard in the predictions and definitely in the realm of dieselpunk. 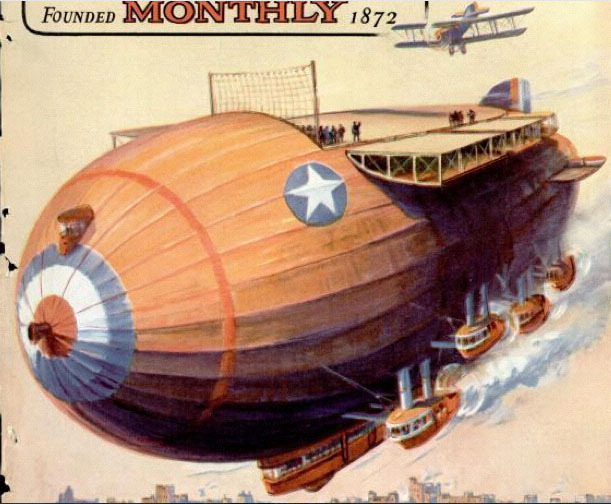 This is not the Akron catching parasite fighters, but a full-bore — and way too small — landing strip on top of a dirigible. The article on page 30 gives more on the “dreadnaughts of the clouds” (if that wasn’t an Early Dreamers story title, it should have been). And remember, folks, cut out those party balloons. It’s important to conserve our helium supply as a war material. 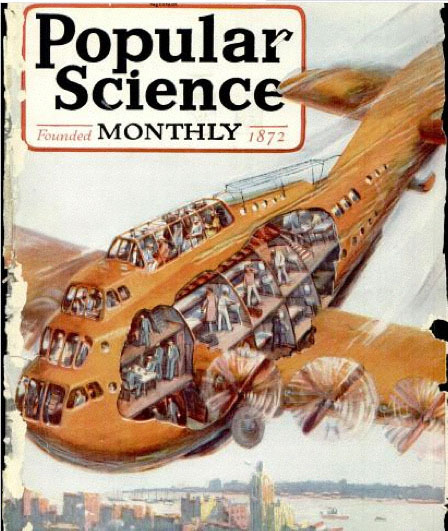 From an article on the latest in long-distance television transmission, page 75 of the May 1940 issue of Popular Science Monthly. These are the great-great-grandparents of the fellow I saw watching his wrist-TV on the bus the other day. Templates are underlying structures of kinds of invented story, whatever genre or media they may be created in. Templates are not formulas, so wipe “formula fiction” right out of your frontal lobes. Fiction formulas are laid down by editors, often rather arbitrarily, and may apply only to one publisher, not even the whole industry. Templates are universal and human. They arise from the audience, and date back before writing, though we can only see them as far back as they are written down, whether the myths of Ishtar harrowing Hell or Isis seeking a dead mate’s resurrection, or the heroic quest of Gilgamesh for eternal life, or the wanderings of Odysseus, or the wars of the Rg Veda. On the other hand, at least one template was founded as recently as the 1950s. Collecting and sorting them has been a hobby of mine for some years, based in a chance remark of a workshopper and my broad basis in myth, epic, folk tale, and fairy tales. Not every story you write will fit a template, but most will because you are as human as anyone else, and as much imbedded in the culture of fiction. If your story is close to a template, it will be stronger if you move either onto the template, fulfilling its satisfactions, or move well away so you don’t look like you just missed the boat. However, you may find that outside of litfi you can’t avoid templates. Many genres are built on, not just a single template, but a single sub-template, like mysteries are basically the Mystery Template. Time to mark things up and see not only where you are going but how to get there. I started using this in 2004, and it works for me as part of the revision process. Using this, I actually find I don’t loathe writing synopses, either. Working from the shorter ones up seems to help. So does simply doing more of them. Step 1 — Write what the book is about in 25 words or less. Yes, “less” is a joke. Avoid conjunctions, particles, etc., as you can, but it must read like a sentence, not a computer randomization of disconnected words and fragments. This focuses you from now on.